My fridge is still stocked with sweet, fresh corn, and I bet yours is too. 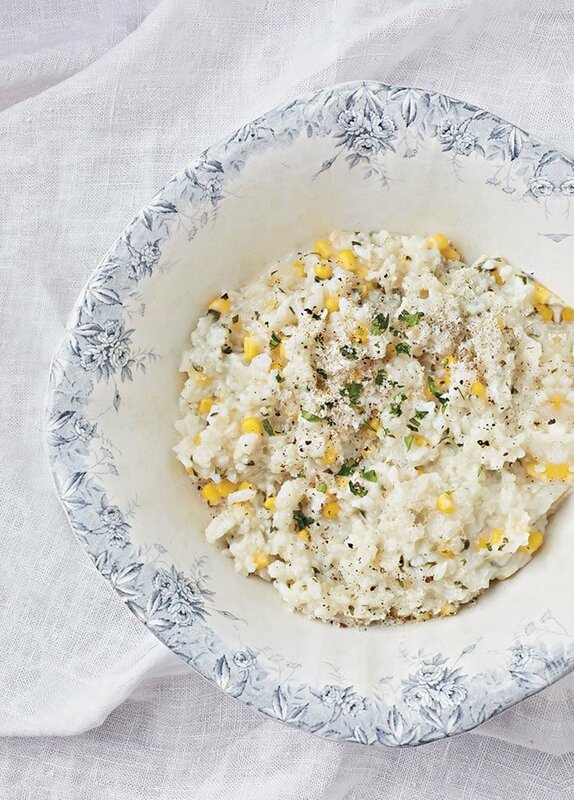 This vegan slow cooker fresh corn risotto uses my favorite corn cob trick that you can read about below. If you are reading this in the winter, don’t fret, you can make this with frozen corn kernels and use bouillon. This crockpot recipe is from my book, Vegan Slow Cooking for Two and Fair Winds is letting me share it with you today. My secret ninja trick involves fresh corn. You may not think that the cob has much flavor in it once you remove the kernels, but you would be wrong. It adds tons of corn flavor and can be used in place of bouillon in soups, stews, and risottos. The corn cobs work great in soups too, just remove the cobb when you’re ready to serve and enjoy the extra flavor. This risotto cooks fast and I like to make it for dinner on summer evenings. It cooks while you take a walk, work in the garden, or set up the deck for dinner. It includes the corn kernels but it also utilizes the corn cob to squeeze every last bit of flavor out of your fresh corn. 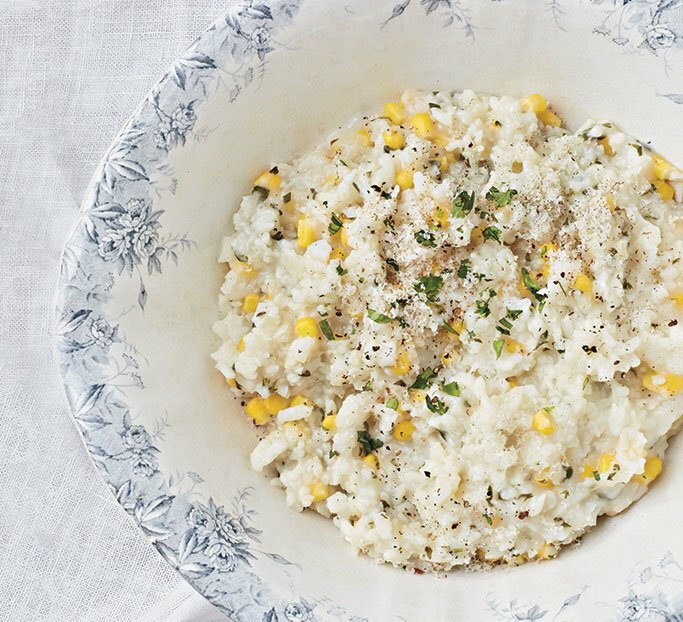 Add the water, rice, and corn kernels to your 1 1/2 or 2 quart slow cooker. Press in the 4 cob pieces and fresh thyme. These last two ingredients are what make the broth really special. Cook on high for about 1 hour, but it could take up to 1 1/2 hour depending on your slow cooker. Check at 40 to 45 minutes in case your slow cooker cooks quicker. If risotto is getting too dry, just add a bit of extra water. Remove the corn cob pieces and thyme stems. Stir in the basil and serve. Top with additional basil if you want to make it look extra special. Can you use Brown rice instead? If so, how much water and would cooking time be longer? Brown rice would probably work. Since I haven’t tried it I can’t give you exact numbers. But I would start with the same amounts and use short grain brown rice if you have it to make it as creamy. 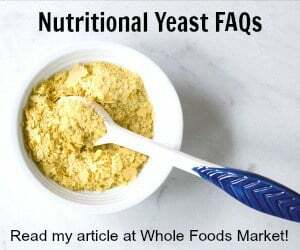 The first time you try it, check and add liquid if needed. This looks delicious. My slow cooker broke so I am trying to replace it with an Instant Pot I just purchased. My question…would I just use the slow cooker function on the IP and manually set the timer for 1 hour? Since this is for a 1 1/2 quart slow cooker I would not cook it directly in the instant pot, but maybe put a few cups water in the insert, the rack and then add the ingredients to a 2 quart pyrex bowl. Or you can double the recipe and cook on manual at high pressure for 5 minutes. Holy Moly, no wonder every recipe I see for the Instant Pot utilizes the pressure cooker function. Double the recipe and 5 minutes? I’m all in on this one. I mainly used the slow cooker with your vegan bean book, it has been my bible for a few years as we eat a,portion of beans and rice daily. Any chance you update that book for the Instant pot, or put out a conversion chart? Thanks for all the bean and potato recipes, we love and make a lot of them. I’m cooking this as we speak and it’s going on 1.5 hrs and not close to done. Is the hour cooking time correct? It looks amazing just taking longer than planned. The time can vary depending on your slow cooker and I wonder if your slow cooker cooks a little lower. I doubt you used brown rice, but it can take about 2 1/2 hours to cook it than the arborio rice. I also checked back into my tester comments and the timing did work for everyone who used arborio rice. I ditto Christine’s comment. This is a delicious recipe, but I tried it with Arborio rice in my slow cooker on High and at the end of 1 hour it was not done. In the interests of getting dinner on the table for a hungry husband, I transferred the contents to a pot and fiinished it quickly on the stovetop in short order. Next time though, I will allow more time for this dish in my slow cooker. Ugh, I wish I had read the comments about it taking much longer… I’m on an hour and ten minutes, and it’s definitely nowhere near being done. I did double the recipe and use a larger crockpot, but otherwise I followed the recipe exactly. It can vary depending on your slow cooker, but I’ll add a note in the recipe. None of my testers had an issue, so until I posted it here I didn’t realize it might take so much longer. I hope it worked out and sorry that it may have inconvenienced you. What does “press in” mean? Your wrote “press in” the 4 cob pieces and the thyme. You press the cobbs into the rice and liquid so that it can infuse. Next time I think I’ll skip the slow cooker and just boil water with the corn cob and thyme then add the water one cup at a time into the rice and corn kernels and basil. Gave beautiful flavors and scent, but end result wasn’t so great this time around. Which brand slow cooker do you have? Also did you use a 1 1/2 or 2 quart one?